Dojran lake is the smallest of the three tectonic lakes in the Republic of Macedonia. Dojran lake is located in south-eastern Macedonia, on the Macedonian - Greek border. Dojran lake is settled in the Dojran valley between the Belasica, Krusa and Kara Bali mountains. It is considered that the Dojran lake today represents remains of a larger Peonic lake and lies on an altitude of 148 m.
There are several rivers that flows in the Dojran lake, but most important are Surlovska and Hanzda. There are also many gorges called by the people "kajnaci". The water from the Dojran lake flows in the river Gjolaja. Due to its small surface and depth, during the summer period, the water in the Dojran lake is considerably warm and in August is approximately 28 degrees, while in the winter period it's getting frozen. The color of the water in the Dojran lake is dark green. 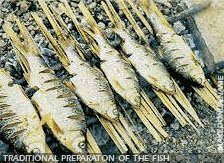 Due to the Dojran lake 15 types of fish, (of which famous are kostreš, plašica, carp, sheath-fish) and water grass (algi), it enters the list of world's rarities due to its special features. 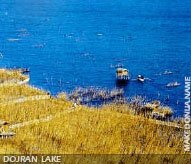 Dojran lake is the richest lake in fish in Europe. 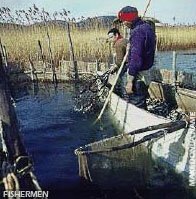 The ancient way of fishing with the assistance of birds (kormorans) and gratings practiced here is very interesting. A similar method of fishing exist only in distant China, and is carried out during the winter. Today the condition of this Dojran lake is extremely poor and reason for this is Greece, member of the European Union, which used the water of the lake for its fields with agricultures. But the situation is extremely bad, and the there are Macedonian-Greek conversation in progress. This Dojran lake can be saved in way of leading water somehow to it. There are a lot of plans for making this lake alive for tourists again after a long time. In September 2002, a waterline from Gjavato, was successfully built in order to fill the lake with water. This helped the condition of the Dojran lake, and in the past few years, the water level got higher enough at the normal, so the situation today is normal.